Excellent word – I’d love to hear what the printing industry has to say about the concept. Doing one copy is obviously useful, but getting 100,000 an hour exactly right for mass distribution might be something else. Also, what about other alphabets (Arabic, Chinese, Korean etc.)? Had to look up Bacon. Smart guy, but bit rate on that method is awfully low. The OP’s method (follow the link) looks very generic to any language that can be written in discrete symbols. New way to pass secret notes in classroom. If teacher confiscates the note, it’d look normal and harmless and pass it. But student who knows can get the hidden message. Kids pass notes via text message these days. 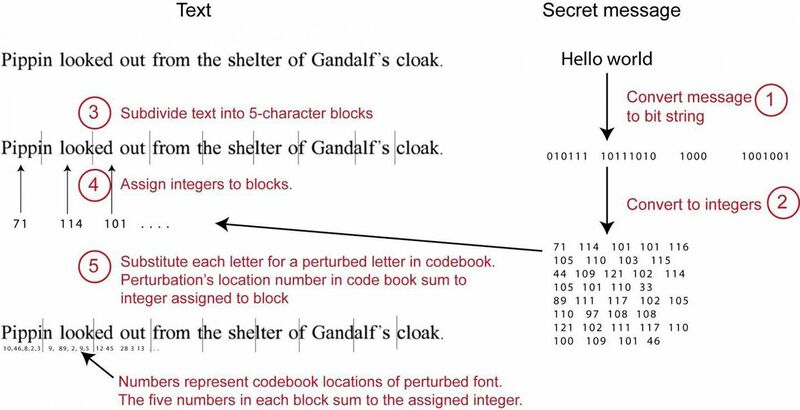 I, for one, write all my secret notes on a computer, encoded with within ordinary characters, then print it and pass it across the classroom. Another way of achieving the same is how many AR viewers such as Arilyn work. They apparently run some kind of edge detection on the image, then hash the shape of the edges and use it online to lookup whether there is any matching information. Thus just the layout of text and graphics becomes the key. So: watermarking /everything/, catching whistleblowers with canary traps, so on? And otherwise fairly useless – who will scan a text with no indication telling that it has ha code? And if it does, why not just replace that indication with (drumroll) a code? QR, url, whatever. When you don´t have to use a QR code, you have more space on the backside of a granola bar for human readable information. QR codes don´t look nice and perhaps do not fit the rest of the packaging´s appearance. I personally don´t like QR codes because I never know if it is a website, a .vcf file or plain text until I have scanned it.This approach could change that problem. how??? now you don’t even know if it _exists_ until you scan it. One solution could be to write in plain text that there is a hyperlink embedded in the text field. It is hard to give you an example, because the distorted text technology does not have a cachy namy yet, as QR-Code has. Another approach could be that in about 15 Years, AR contact lenses are an everyday thing and hyperlinks will pop up everywhere you look. In this scenario, I sincerely prefer hyperlinks hidden in plain text instead of qr codes, since QR codes are visual noise whereas this technology is hidden in plain sight. Just put little logo there. The same way you put “@” to text to tell people that it has hidden meaning of being mail address. alternate reality games. where items in the real world interact with websites and often involves the kind of strange, disjointed problem solving reminiscent of 90’s adventure games. 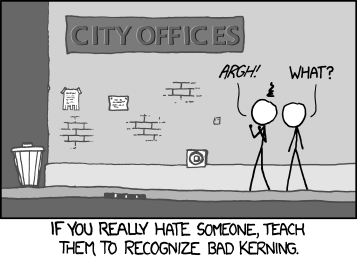 A friend and I devised a system several years ago that worked simply by altering the kerning. A normal kerning table was used with Times New Roman font at 12 pt (or any non-ornamental font at any reasonable size), and appropriate distances between each combo pair of letters. To represent a “0” the standard was used, and to represent a “1” the kerning was widened slightly by a 1/128th of an inch. Imperceptible to the human eye, but our modified OCR scanner picked it up easily and spat out a binary stream for the encoded information. We eventually cut out the OCR part and simply looked at the gaps between the letters. The only ‘complication’ is that you needed a copy of the kerning table it was rendered with, but that was easily extracted from the .ttf font file. The first part in step 6 adds up to (10 + 46 + 8 + 2 + 3=) 69, not the indicated 71. Nitpick, maybe, but this is supposed to convey the idea and supplying the wrong information undermines that process.